Fire, heat, smoke, glass breakage and other detectors for a variety of applications. 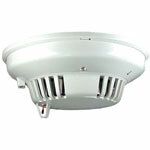 F220-P, Photoelectric Smoke Detector. Base not included. See accessories.